I’ve been glued to Al Jazeera English television — it’s broadcast over the air here in Washington, but available online — and watching the horrifying news of escallating violence against the Libyan people by some of their military and (reportedly) foreign mercenaries. On the other hand, other members of the military and diplomatic corps have sided with the demonstrators. It seems like the beginning of the end of the regime, but many have died and shall die before it’s all over. I’m praying for a swift and peaceful resolution, including the removal of Muammar al-Gaddafi from power and his being brought to justice. A note about visuals, for those sharing in solidarity. 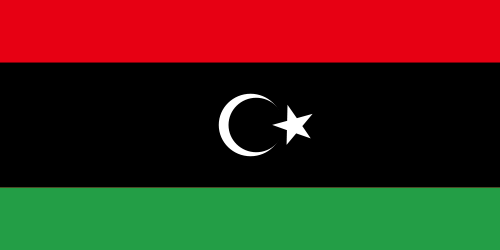 The all-green Libyan flag most of us know is al-Gaddafi’s doing; the “independence flag” shown below has already been used by his regime’s opponents. So make those ribbons or armbands red, black and green. The image is in the public domain, and you can get other sizes here. Yemen is getting rough too. I follow Jane Novak’s Armies of Liberation on Yemen….